Sameer Burande (extreme left), Dr Ashish Uzgare, Dr Mahesh Burande and Dr Aruna K (extreme right) felicitating Sanjeev Pendharkar (second from right). 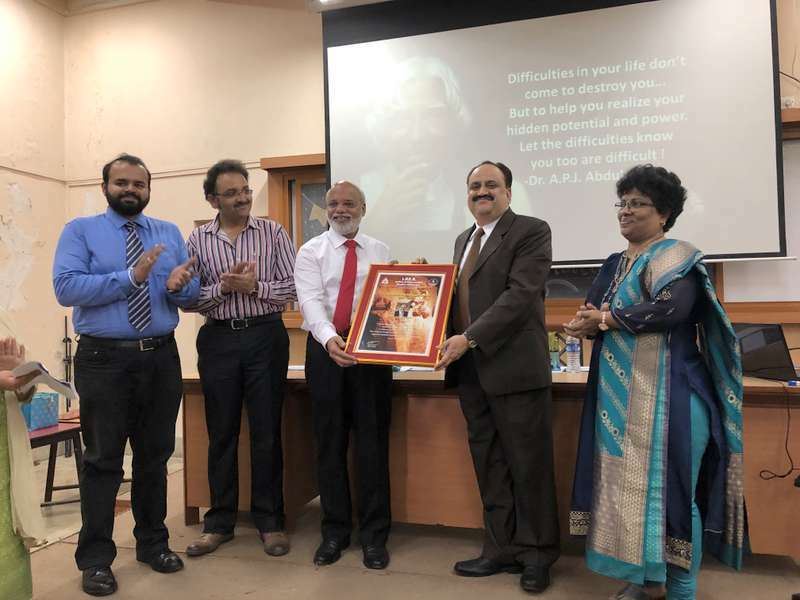 Sanjeev Pendharkar, Director, VICCO Laboratories, on February 23, was felicitated with IPER’s Outstanding Performance Award 2018-19 at a diploma award ceremony held at Wilson College in Mumbai. Pendharkar was invited as a chief guest to felicitate award winning microbiologists at Wilson College. Apart from students, prominently present during the ceremony were Dr Aruna K (HOD, Microbiology), Dr Ashish Uzgare (Vice Principal, Wilson College), Dr Mahesh Burande, Sameer Burande, Monisha Burande, among others. During his address, Pendharkar emphasized on the importance of quality and role of microbiologists in product design and manufacturing. He explained to the students their role as microbiologists and how they can study micro-organisms to understand their effect on our lives and how we can exploit them. He talked about the persistent increase in pollution level and role of Algae to manufacture biofuels like diesel and increase oxygen level in the atmosphere. Pendharkar informed that a number of government agencies and companies are funding efforts to minimize operating capital cost and make Algae fuel production commercially viable. He also informed that attempts are being made to cultivate Algae into large amounts to manufacture bioethanol, biodiesel, bio gasoline, bio butanol, bio methanol and other biofuels. Pendharkar’s advice to students regarding the importance of development of various skills for personal excellence was also well received and appreciated.